I decided to post a rewritten scene from CP2 under the spoiler tag. It is the scene that begins around page 468, with Will in Henry’s room. If you put the scenes side by side you can see the differences — the timing of when Charlotte learns a certain piece of information, where Will is when a certain thing happens, the players who are present, and Jem and Will’s attitude toward each other. “Tessa is awake!” Charlotte announced happily, darting through the door of her and Henry’s bedroom like an excited hummingbird. 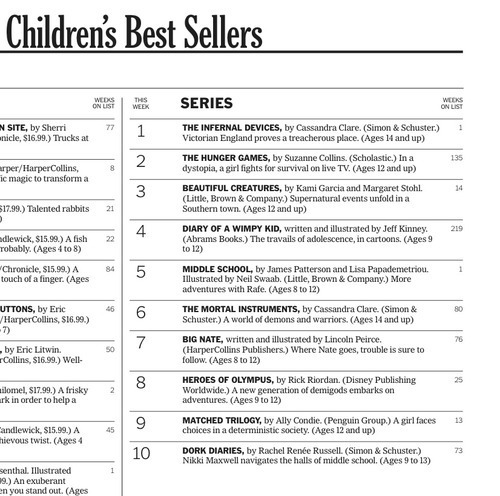 A congratulations to Cassandra Clare is in need. To wrap up Cassie's Clockwork Princess March tour, Cassie visits Vancouver, Canada. Will urged the horse toward the stable doors and, bending his head against the wind, galloped out into the night. 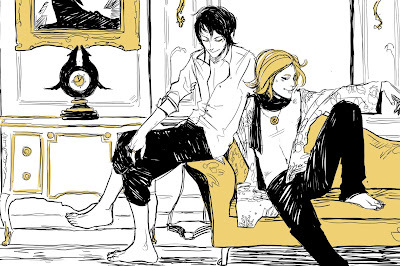 Woolsey threw himself into a flower-patterned armchair while Magnus moved toward the fireplace and leaned against the mantel, the very picture of a young gentleman at leisure. Tessa, glancing quickly from side to side to check for traffic, dashed across Blackfriars Bridge. He tasted like snowflakes and wine, like winter and Will and London. I am not good with words, so I wrote how I felt about you in music,’ said Jem. 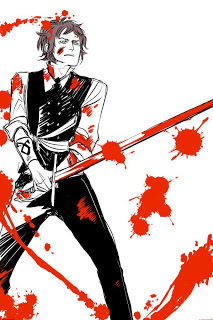 Gabriel Lightwood leaned against the wall inside the Institute doors, his jacket gone, his shirt and trousers drenched in blood. "So you lied?" Seizing up her fallen cap, Sophie rose to her feet. "Do you have any idea how much work I have to do, Mr. 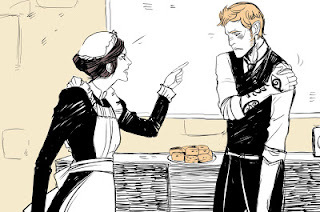 Lightwood?" "I’ll train with you," Will said. Cecily held her blazing seraph blade out in front of her; she looked absolutely fearless. Jem brought his hand up and cupped her cheek. She could see the hope in his expression, slowly dawning. Earlier this week, Lily Collins invited all the Shadowhunters to WonderCon. 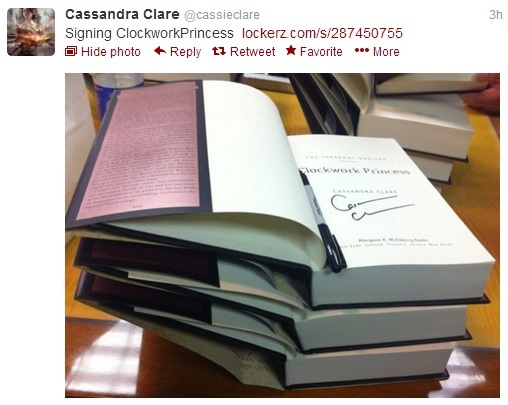 As promised, Cassie posted (on tumblr) details about WonderCon, the movie, and her Clockwork Princess tour. By me, yes. 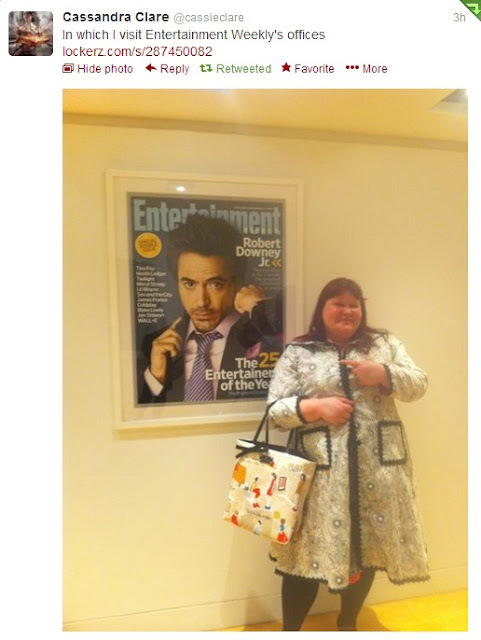 By Lily, probably not — she is around for the Q and A part of the signings and some photos, but she won’t be signing book. WonderCon is set at the Anaheim Convention Center, California. For more info visit ComicCon/WonderCon.org. I am pretty sure the new poster is just for movie theaters. Usually when they start selling movie posters it is through bookstores, comic stores, Hot Topics, etc. and it’s closer to the film’s release. 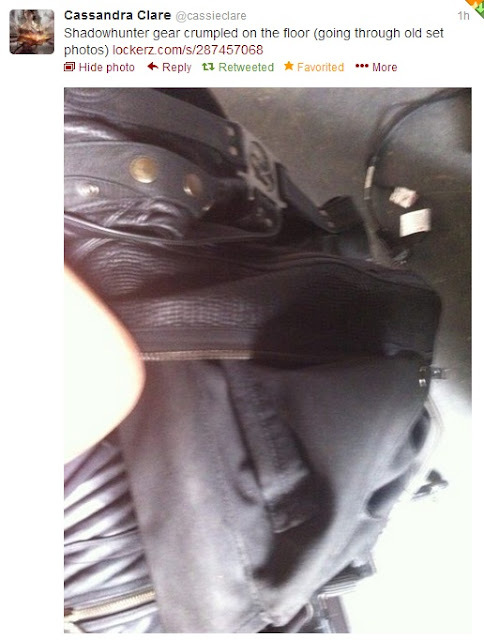 3) Consider staying off tumblr entirely. And when you do get the book, don’t read the family tree first. You’ll be sorry if you do! It would be nice if you could trust other people to protect you from spoilers but you CAN’T. You have to protect yourself. "There's no magic formula," author Cassandra Clare says, but many factors play into the popularity of fantasy novels. With more than 22 millioncopies in print worldwide of her two fantasy series, The Mortal Instruments and The Infernal Devices,author Cassandra Clare might be considered an expert on fiction that appeals to teens. Clare, 39, whose final book in the Devices trilogy,Clockwork Princess, will be released Tuesday, says "there's no magic formula." 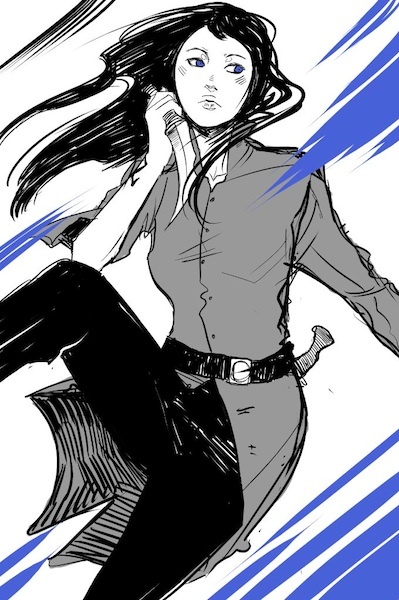 But what she's doing — imagining a secret society of young demon hunters, known as Shadowhunters, in a world of vampires, werewolves and warlocks — is working like magic both in bookstores and Hollywood. The film adaptation of the first book in Clare's first series, The Mortal Instruments: City of Bones, starring Lily Collins and Jamie Campbell Bower, will hit theaters Aug. 23. And if that's not enough, Clare and Holly Black (co-author of The Spiderwick Chronicles) are collaborating on another series, Magisterium, aimed at middle schoolers and set in a world of dark magicians where child apprentices train to be warriors. The Iron Trail, the first of five books, is to be released in September 2014. It too has been optioned, and Clare has been signed to write her first screenplay. Clare, a former writer for The Hollywood Reporter who lives in Amherst, Mass., says there's no simple explanation for her popularity, but she suggests that it has to do with her characters, often strong females, "whom my readers can relate to." She says that "readers may suspend their disbelief when it comes to the fantasy and the magic, but they need to believe in the characters — teenagers who have some of the same concerns that they do." Romance is a big part of both series. 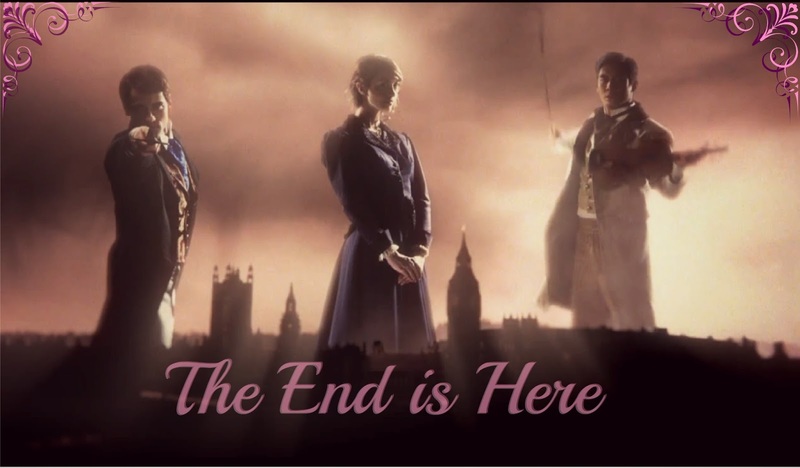 The first is set in contemporary New York; the second is set mostly in Victorian England. She likes to mix "the real and the unreal, the famous and the forgotten" in her fiction. For example, in Clockwork Princess, an aesthetic werewolf named WoolseyScott lives in London at No. 16 Cheyne Walk, which, in real life, was once shared by writer Algernon Charles Swinburne and poet/painter Dante Gabriel Rossetti. Like Scott, she notes, Swinburne and Rossetti were members of "the aesthetic movement," which valued aesthetics in arts over political or social themes, but they were not werewolves — or, as she puts it, "proved not to be werewolves.". - In a technological age "filled with computers and gadgets, readers yearn for some magic." - As a genre, young-adult fiction is "genre-busting." Adult fiction, she says, tends to be labeled "either romance or sci-fi or historical fiction or literature. They're in different sections of bookstores. But YA novels, whether it's Twilight or The Hunger Games, combine all or most of those elements." Clare says her own series are a "combination of urban fantasy, adventure and romance." - The generation of readers who grew up on Harry Potter, "the first big teen sensation, feel connected by what they read. They want to share their experiences, usually online …. I think you find a big overlap between kids who are into fantasy and sci-fi and kids who build their own online communities." 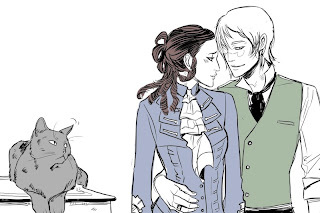 Clare isn't revealing much about Clockwork Princess but promises to resolve the series' love triangle involving heroine Tessa Gray, who's engaged to one boy but drawn to another, in "a way that no one has predicted yet." As for her Instruments series' sixth and final book, City of Heavenly Fire, to be released a year from now, she says to expect "a hard-fought battle and a lot of epic romance." Check out EntertainmentWeekly's review of Clockwork Princess. 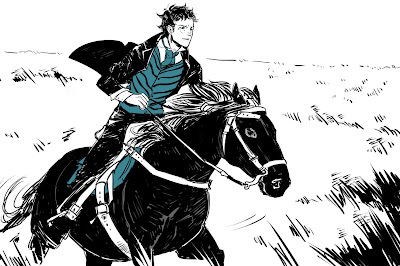 It's unsurprising that Cassandra Clare's name has become synonymous with the YA fantasy genre. 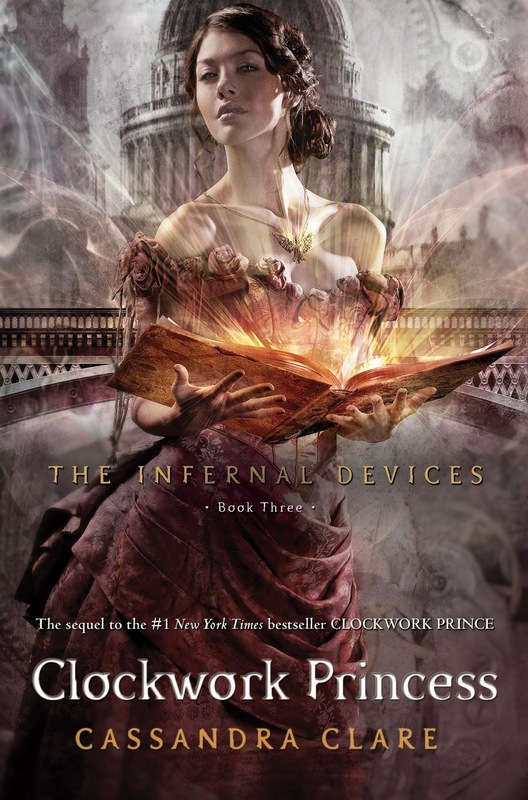 Her first series, The Mortal Instruments, is wildly popular, and a movie based on its first book, City of Bones, hits theaters this August.The Infernal Devices, a prequel series, hasn't had the same buzz, but it's as addictive as — and dare we say better than? — Clare's original franchise. Set in Victorian England, Devices centers on Tessa Gray, a teenager who gets sucked into the world of Shadowhunters, a secret society of demon chasers, at their safe house, the London Institute. 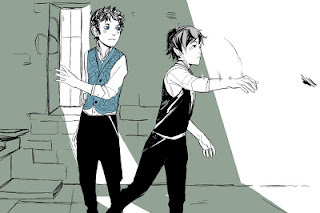 In Clockwork Princess, the third and final installment, Tessa leads the fight against Mortmain (a.k.a. the Magister) and his army of clockwork automatons that threaten to wipe out the Shadowhunter race. Oh, and the automatons are fully functional because they've been reanimated with demon souls. We'll pause so you can roll your eyes at the admittedly far-fetched premise. 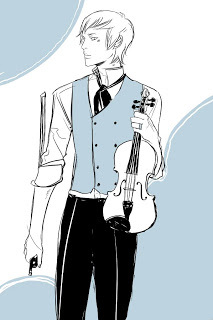 But if you're willing to suspend disbelief, you can focus on the real heart of the story: Tessa's tangled relationships with her fiancé, Jem Carstairs, who has a terminal demon-related illness, and Jem's blood brother, Will Herondale, who's also in love with her. No part of their triangle can be split without heartbreak. The release of Clockwork Princess is drawing near; there's less than 2 more weeks left. Cassandra Clare will be on tour and stopping at Phoenix, Las Vegas, Los Angeles, Mission Viejo, Menlo Park (San Francisco), Seattle, and Vancouver (Canada). Some lucky fans will get to meet Lily Collins at the Los Angeles stop. I also have some exciting information for those coming to the LA signing: we’re going to have a special guest — Lily Collins. She’ll be at the store to take pictures with fans and also to answer questions about playing Clary in the film. Lily is incredibly sweet and I’m so glad she’ll be there! 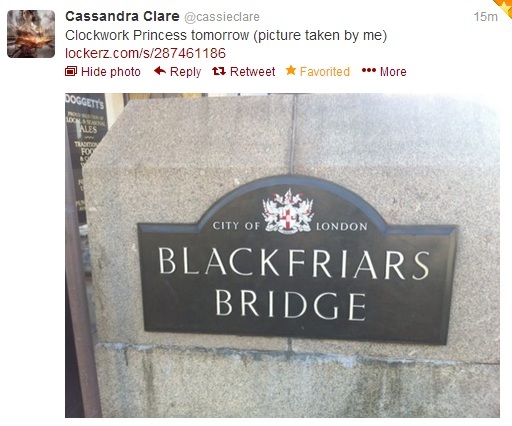 For more information about the Clockwork Princess tour visit Cassie's website. Will you be going to any of the tour stops? Let us know! Only 18 days until Clockwork Princess is released, and if you haven't gotten a chance to buy a copy, here's your chance. 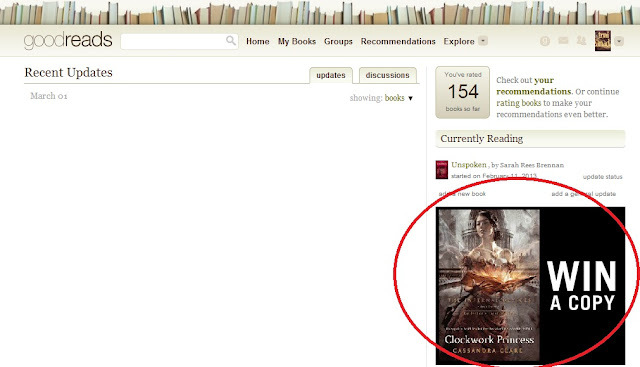 Simon Schuster is giving away 20 copies of Clockwork Princess on Goodreads. However this give away is to Canada only. Contest closes on March, 19. Go enter here for a chance to win. Daniel Sharman finished recording the Clockwork Princess audio book a few weeks ago. Now, MTV.com has an excerpt of the recording. Unfortunately, this video is only available for US residents, but don't worry, it's just the reading of the first chapter (which you can read here). The only thing you'll be missing is Daniel Sharman's British accent reading to you. Check out the preview on MTV. Yesterday (Feb. 26) was an exciting day. First we got more exclusive footage of Magnus's party (City of Bones movie) from MTV and an interview with Godfrey Gao. Then, starting from 3 pm EST, Shadowhunters continuously tweeted #ClockworkPrincess for the reveal of the first chapter of Clockwork Princess. For approximately every 100 tweets, 1 word would be summoned. There are 5464 word in the first chapter so of course this took us a while (over 500 000 tweets), but we made it! "December is a fortuitous time for a marriage,"said the seamstress, speaking around her mouthful of pins with the ease of years of practice. "As they say, 'When December snows fall fast, marry, and true love will last.'" She placed a final pin in the gown and took a step back. "There. What do you think? It is modeled after one of Worth's own designs." Check out all of the first chapter at Shadowhunters.com. If you haven't already, check out the prologue on the Shadowhunter App (available for Apple and Android users). 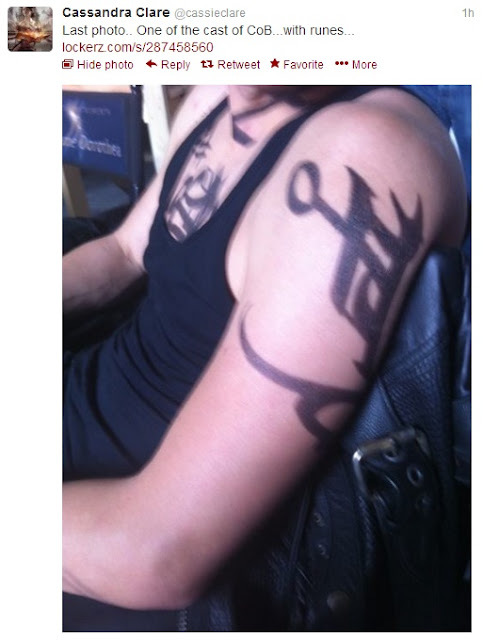 We happen to notice the background on Shadowhunters.com, isn't it nice? 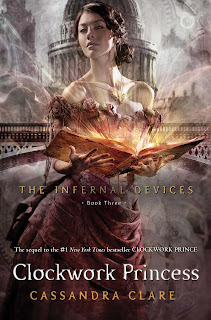 "You’re only a few weeks away from reading Clockwork Princess, the thrilling conclusion to The Infernal Devices trilogy. The cover has been revealed thanks to your help, you’ve watched the trailer, you’ve read the Prologue available in the Shadowhunters App, but still you want more! Well, you’re in luck, and once again, you have the power! Will, Jem, Tessa, and Charlotte – their story continues in the first chapter of Clockwork Princess, but the text will only reveal itself for those who believe…and those who tweet! Every time you send a tweet with the hashtag #ClockworkPrincess, the chapter will make its way into our realm and one by one, the words will be revealed. Are you up for the challenge?" The #ClockworkPrincess challenge will commence on Tuesday, February, 24th! So, set your calenders, tell your friends and family to tweet at 2 pm EST/ 11 am PST on Tuesday!